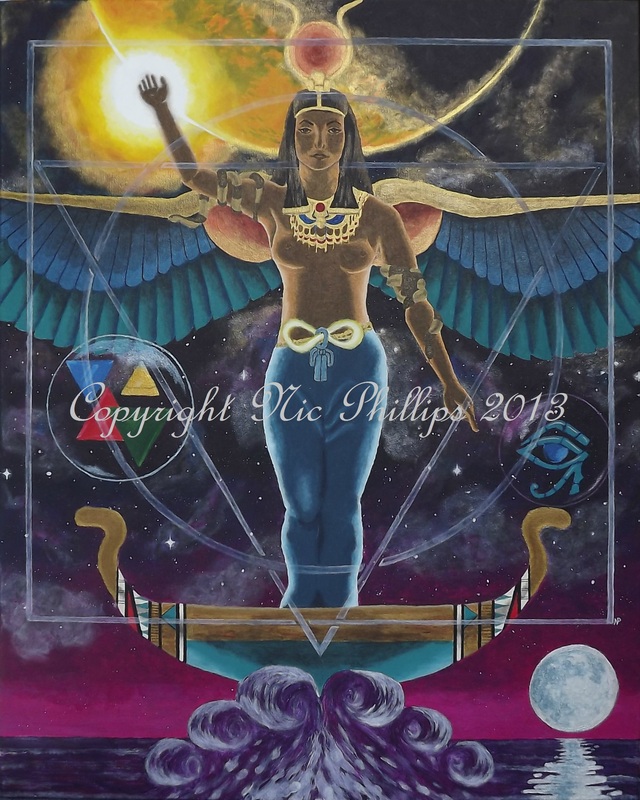 This cosmic depiction of the goddess Isis is a development of the idea I first designed for the Magician card in Pistis Sophia: The Goddess Tarot and you may recognise the similarities. Here Isis is shown as mistress of magic, drawing down power from the heavens in the ‘As Above, So Below’ pose. Within her sphere of control are the elements (their symbols on the left) and the power of Ra, which she obtained through cunning, having tricked the Sun God into giving her his true name, the source of his power. She is also pictured on a barge which is a reference to one of her epithets ‘Star of the Sea’, being the original Stella Maris long before the Virgin Mary. Acrylic on canvas (24in x 30in).